How can satellites monitor land use change ? In geography, land use is the description of how people utilize the land: fields ? pastures ? settlements ? forests ? etc. Land use change means the variation in land use. Forest clearances, growth of cities and rehabilitation of former industrial sites are examples of land use change. By comparing 2 satellite images acquired at different times, we can see the changes in land use. Land use and land use change ! 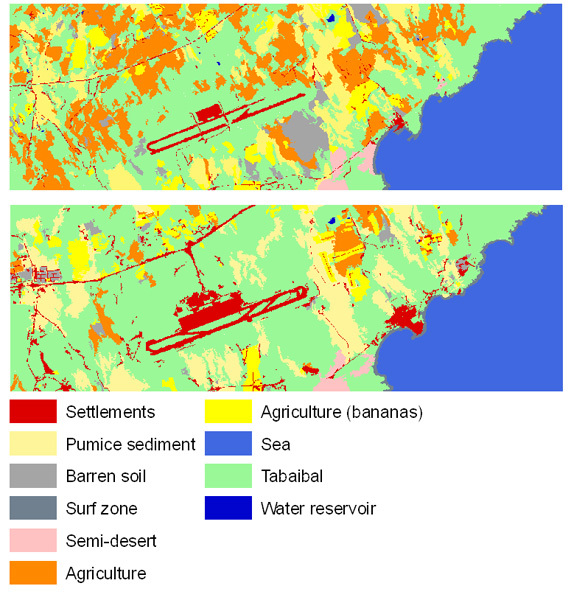 Land use change around the airport near El Médano (1978-1996), Tenerife. Source: Naumann 2008. Click on the image to get the colour legend.